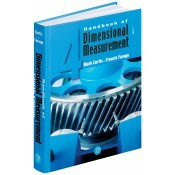 Handbook of Dimensional Measurement, Fifth Edition features one completely new chapter covering "The Measurement of Geometric Dimensions and Tolerances," while providing comprehensive state-of-the-art treatment of all known dimensional measurement devices and techniques. Includes a completely new chapter covering The Measurement of Geometric Dimensions and Tolerances. Includes an improved and expanded illustration program, with 50 new figures and new digital photographs. Supplements discussions with nearly 600 illustrations, line drawings and photographs. Includes improvements and innovations made by the leading manufacturers of dimensional measurement equipment, hardware, and machinery from the last edition. Describes equipment, hardware, and machinery in explicit narrative detail. Brings all references to national and international standards up-to-date.